And now, Let's Talk Esmé Shapiro! LTPB: Tell me about how Ooko became the Ooko we see in this book. How many incarnations did you go through before you had her just right? How did the visual story evolve as you got to know her? 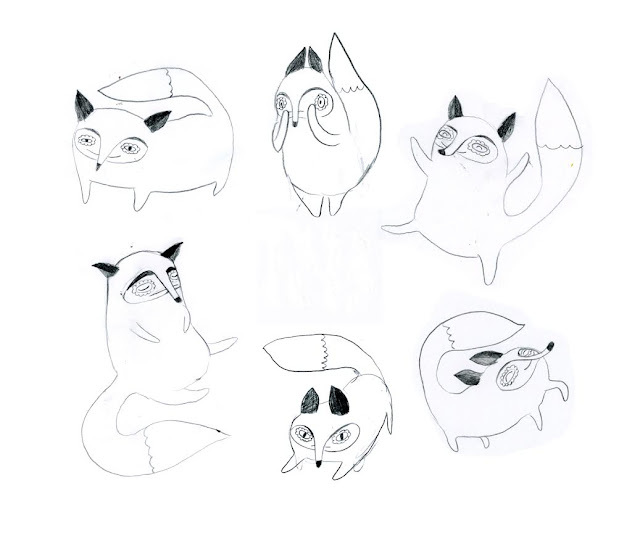 ES: Ooko is a fox who has had many re-births. A lot of the process of her evolution had to do with stripping away my style biases and letting Ooko’s character shine through her features. A lot was revealed to me about the nature of who she is as I cycled through her various transformations. As you can see, Ooko’s first incarnation was actually just an orange fuzzy case for eyes. At the time, I was really interested in pairing down images into their most essential forms. I didn’t want to add any detail that wasn’t absolutely necessary. Ultimately, though, I found that the variety of expressions I could give her were quite limited. I knew I had to find a way to expand the design of her face if she was going to be the main character of the book. I decided that perhaps it would help to paint Ooko from a head on angle. I also LOVE the color red, and wanted to see what it would be like to have a bright red main character. Changing Ooko into a red fox made me realize that I actually prefer to use red in my paintings as accent colors only, for little unexpected bursts of color. Also...this version of Ooko is just plain spooky! I would not want to run into her in the woods. So I knew I had to make a few changes. So I brought her back to her original state of being - an orange fox. But she was still missing a crucial aspect of her face - a mouth! Why was I so avidly avoiding Ooko's mouth? To this day I don’t fully understand. A part of me felt completely overwhelmed by the power of a mouth. I was hoping to be able to show a range of emotions through just her eyes - but Ooko was a big personality, and needed a larger range of expressions. LTPB: Oh my, that is QUITE the process!! So how did you go about narrowing down your focus to highlight Ooko's personality? 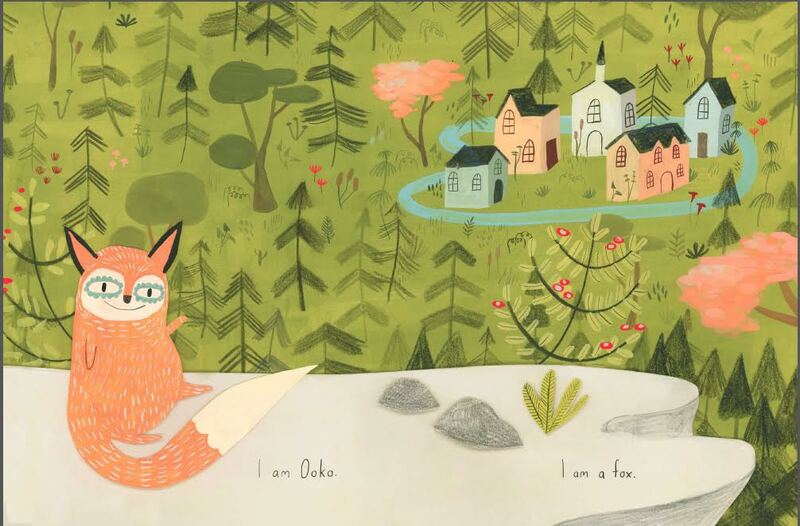 To me, Ooko is a vivacious, ever-curious creature, the type of character that never apologizes for her questions and is always willing to put herself out there. At the same time, she has a little bit of a Rumpelstiltskin/Cheshire cat in her. There is something wild and untamed about her behavior. She is sweet yet mischievous, and her face had to mirror that. So it was time for a mouth …. and eyebrows??? Every time I look at this set of sketches I laugh. First of all, I was still trying hard to hold on to Ooko’s long snout, but once the mouth was introduced it made the snout look more like a trunk. This trunk absolutely had to go. Perhaps the funniest part about this though is her eyebrows!! I come from a family of people with very prominent, expressive eyebrows, so there is something very comforting to me about seeing a fox with big expressive brows. But Ooko was looking a little bit too Charlie Chaplin-esque, so I knew they had to go, too. Once I arrived at Ooko’s final incarnation it was a huge relief. She had all the features that would help me fully express her inquisitive and mischievous nature. Not to mention some legs to run around on! A lot of the process of creating her was about letting go of my preconceived ideas of how I wanted a fox to look like - and letting who she really is shine through. LTPB: You and I talked about this a little bit, but every time we see Ooko she’s on a different page or somehow visually apart from the other characters in the book. Was this a conscious decision? How did you work to emphasize Ooko’s loneliness? And how do these visual cues evolve by the end of the book? ES: I have to admit, sometimes I don’t fully comprehend my choices I make in my paintings until after they are done. Painting is such an intuitive process for me, I almost go into a state of meditation. Keeping Ooko visually separate from the other elements and characters in the book was an unconscious decision. I do remember looking at the sketches though, and realizing that was a visual theme after they were done. I decided to push that sense of isolation even further on some of the spreads. I also really tried to emphasize that through Ooko’s new dynamic face. Her mouth proved to be especially helpful. 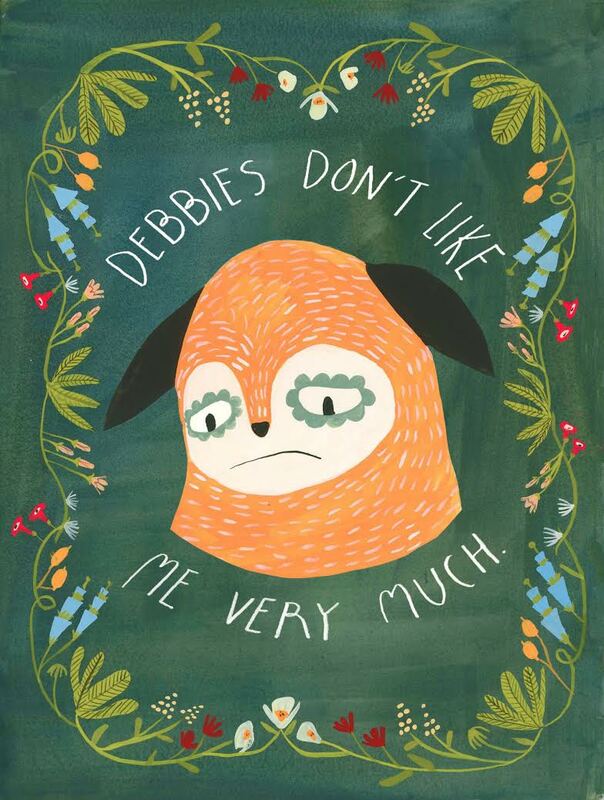 Especially in the illustration where Ooko is coming to terms with the fact that the Debbies don’t like her very much. If you look, the mouth is just a little bit jagged, as if she has a quivering mouth. It is little details like this that push her loneliness to the forefront. Eventually, Ooko meets her potential Debbie, and this is the first time the reader sees Ooko so close to another character. And yet, as Ooko gets to know her Debbie and realizes they have very different interests, the visual space between her and her Debbie grows larger and larger. I don’t want to give away too much of the book - but eventually Ooko meets another creature and they always share a page and a sense of closeness that seems quite natural. 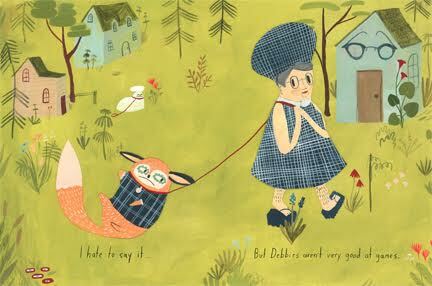 LTPB: Ok, this seems like the perfect time to ask about Ooko's Debbie, who mistakes our little fox for her dog, Ruthie. This Debbie has some of the hairiest legs I’ve ever seen, and Ruthie never stops smiling (not even at night!). I love it so much! Can you shed any light on this odd little duo? How much time did you spend building a story for them? 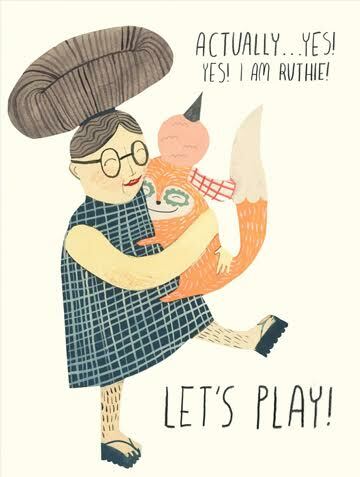 ES: Ruthie and her Debbie are in fact an odd pair, but they really do adore each other! In my mind, Ruthie is a very cultured creature. In her spare time she takes college level courses online and listens to Jane Austen Books on audio tape. She probably likes to garden and read up on the Farmers’ Almanac to make sure she knows what seeds to plant for next season. Her Debbie creates the kind of environment for her that she can expand her mind in. She and her Debbie probably set up still lives of fruit to paint with each other, and they probably read each other the morning paper as they sip their teas. Ruthie is, perhaps, even more of an intellectual than her Debbie - which is why she is always up and smiling - even when everyone else is sleeping! She is probably pondering her next novel. As for her Debbie’s hairy legs - I must say all of the maternal figures in my life never had time to shave their legs. I have always connected hairy legged women with powerful, smart, and adventurous folk, and I felt it was about time for a woman to have hairy legs in a picture book. What’s funny is that none of the children I have read Ooko to ever seem to comment on the hairy legs - or even notice. They just accept her hairy legs as a part of who she is. A lot of adults find it funny, or even a bit disturbing though, which I think is quite interesting. ES: I use watercolor, gouache, and colored pencil. I absolutely love how dense the pigment of gouache is. To me, it feels like I am painting with velvet. I also love how forgiving it is. You can layer the paint, and it will dry quickly with a wonderful matte texture. I was in art school for 8 years, so I have used all sorts of mediums, but I have found that gouache and watercolor are the media that feel most intuitive for me. The only problem I ever have with it is when it feels a little too clean. That is when I break in the colored pencils, because they can add a bit of a gritty feeling. I also should mention that a lot of the characters are painted beforehand and then cut out with an x-acto knife so I can play around with composition. LTPB: What’s next, either for yourself or Ooko? At the moment I am illustrating a book called Yak and Dove, written by the wonderful Kyo Maclear. It is truly wonderful to be collaborating with an author I respect so much. I immediately felt connected to the story, and I am so thrilled to have been given the opportunity to bring it to life. I am also working on other manuscripts that I have written myself - so we will see! LTPB: If you could have one person illustrate your picture book biography, who would it be and why? ES: I would probably chose Lisbeth Zwerger. 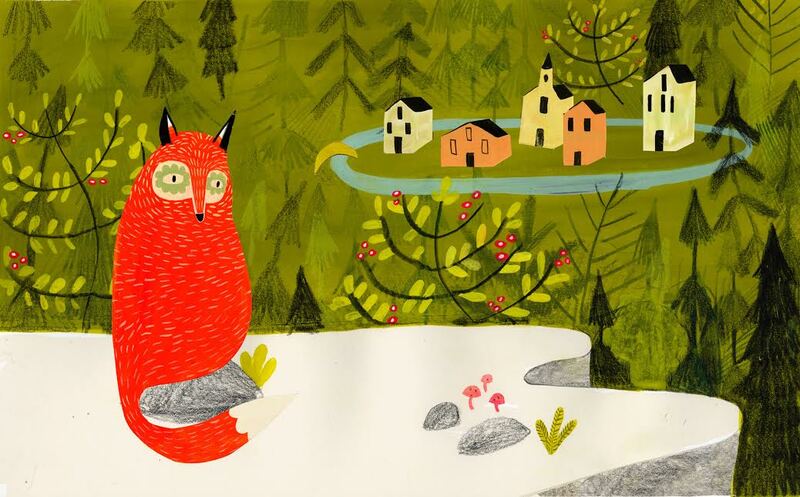 Her illustrations are such a beautiful blend of whimsy and sincerity. Her characters are all a little off kilter too - and I appreciate that. 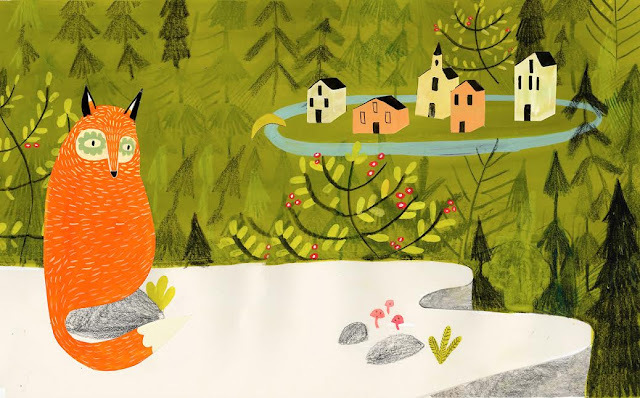 I love an illustrator who is willing to ride with imperfections. 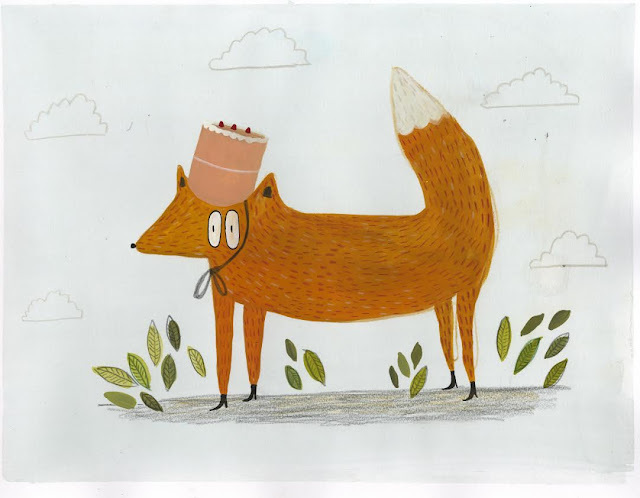 Thank you so, so much to Esmé for stopping by Let's Talk Picture Books to chat with me! I think I made it pretty clear how much of an impact this book has had on me, and it was such an honor getting to chat with you! 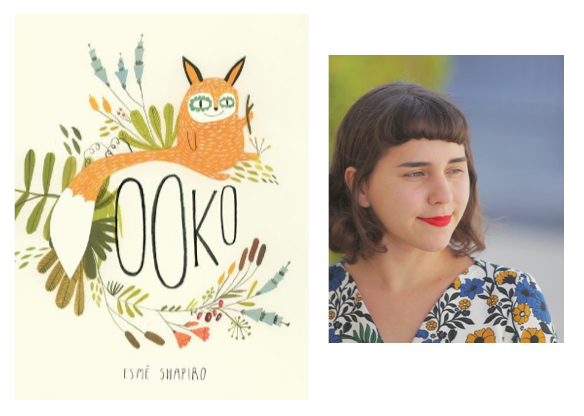 Ooko is available July 5, 2016 from Tundra Books. Special thanks to Esmé Shapiro and Tundra Books for use of these images!